So I'm currently in the middle of four paintings. Three of them are landscapes, one of them is a still life. Based on past critiques the landscapes seem to be supporting themselves. The space is much clearer in my landscape paintings. So what I've been focusing on creating depth of space in my still lifes. I really like my current set up... More background... 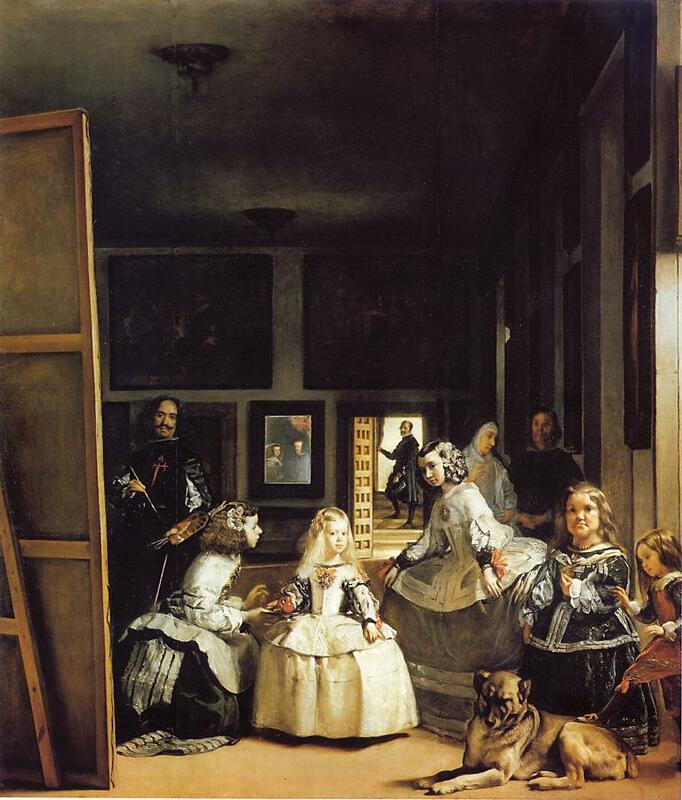 In my painting seminar we were looking at Las Meninas. My point of interest is the mirror in the background. In that little space the viewer sees him/herself as the king and queen. The discussion reminded me of some of my earlier work with mirrors in still lifes. In particular, I was reminded of the options mirrors provided for opening up space in the painting. I often have little self portraits in my paintings as a result of some reflective surface, but I haven't been pushing this option lately. It's always nice remembering something I was really interested in and only stopped working on because someone knocked over my still life*...Anyway, I really like this still life. There are two mirrors and the reflections get really complicated. There's an object which only appears by way of reflection off another object. I even have diffraction through water showing up in one of the mirrors! (I had been trying unsuccessfully to get diffraction to be prominent in a painting for a while, now it happens incidentally 9_9). This was complex enough I needed to make a view finder. I haven't done that in sooo long. I was rather nostalgic about it. ^__^ I first cut the hole inconveniently large so I had to origami it to a quarter the area. *Though if that hadn't happened I wouldn't have decided to start painting landscapes from photographs on account of photos being perfectly fine to fall 3ft.